I’m so glad that Gmail has made some new enhancements to their online email application. If you are a Gmail fan like me, who checks at least 3 gmail accounts daily, I believe the 5 new nifty features announced by Gmail Blog will be right up your alley! It can be very frustrating to have alot of emails to read, and you have to open every single message, and click “Back to Inbox”, then select the next email you want to read. The shortcut will eradicate that “lengthy process”. Simply press “[” when you want to read a new message and archive the old one. You can also use the right bracket “]” to move the other way if you want to open newer messages after you archive it. If your best buddy ever accuses you of not sending you pictures of your secret admirer, you got the best proof to shake him off. Just use the search functions with a little help of Gmail hacking, copy and paste the URL and email it to your friend. On the other hand, your friend’s Gmail will be performing the same search which you did to find that email. When you click the “back” button, you no longer have to worry that it will reload back to your inbox. Browser history is something that often doesn’t work well on complex web applications like Gmail, but the Google team had manged to break that code. You can use the browser navigation buttons (back and forward) to move between emails. You can also open your browser history and click on specific emails that you’ve read to go right back to them. Previously, when you try bookmarking an email message in Gmail, you would be bookmarking the whole Gmail site. Not anymore! All emails now have been coded with dedicated URLs. By adding a browser bookmark while viewing a message, you can return to it whenever you want, just like a regular web page.You would need to be logged in to use this feature though. Ever wish that you can filter emails through certain keywords? The Google Team just had made it happen. They have added a new capability that makes a filter based on the message you are reading, so you can keep track of future similar emails. 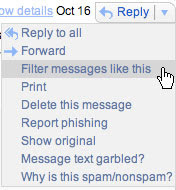 By clicking on the dropdown menu in the upper right-hand corner of every email (the upside-down triangle), you can now see the option to “Filter messages like this.” You easily create a filter based on the sender, and this is especially handy if you are trying to filter emails sent to mailing lists. They’ve also automatically set up a filter for you based on the “list ID” header, which does a better job of finding emails sent to mailing lists.